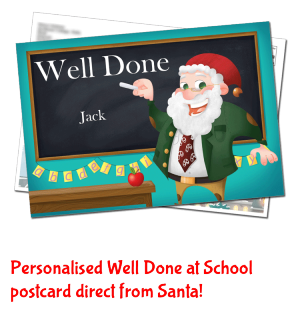 Each letter is personalised, printed, posted and then delivered direct to your child in a festive envelope with a north pole stamp. Simply choose the background design for your letter, fill in your child's personalisation details including your child's age, a friend's name, their home town and lots more. 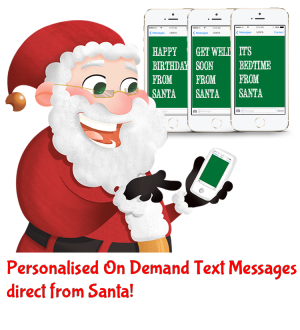 Along with the festive envelope your child can also receive a personalised text message on Christmas Day morning direct from Santa Claus. 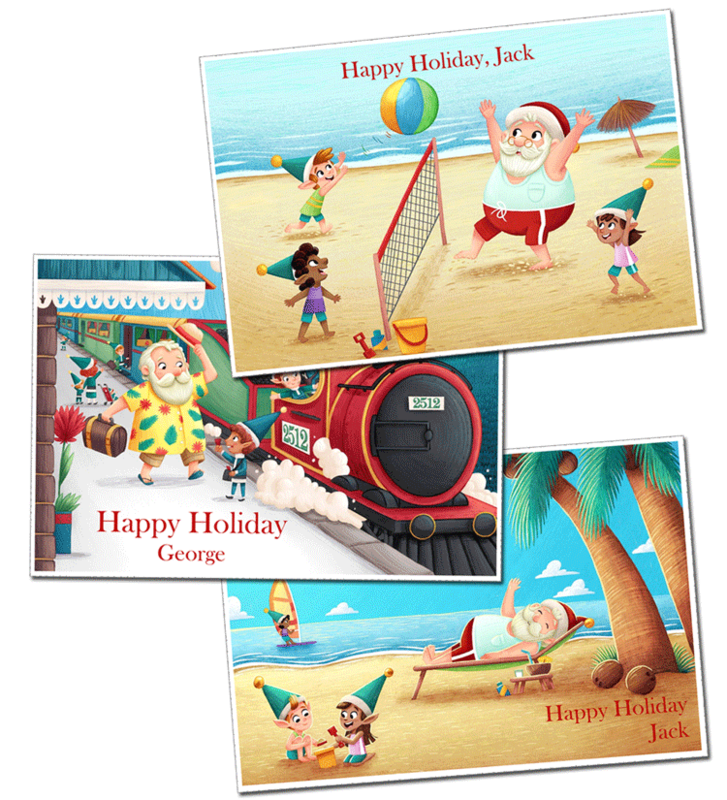 Each beautifully created book is personalised based on your child's name, each story created will be different for each child. 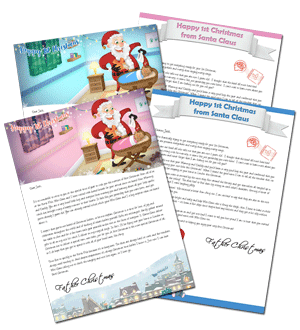 Celebrate your Baby's 1st Christmas with a personalised letter from Santa, with our beautiful letters from Santa you will have a fantastic keep sake to look back on in the future. 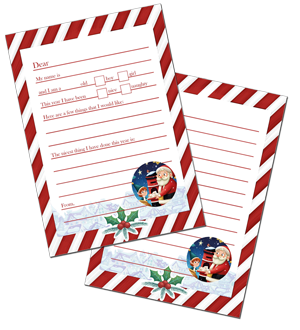 Every child should write a list to Santa letting him know their wishes and achievements throughout the year. 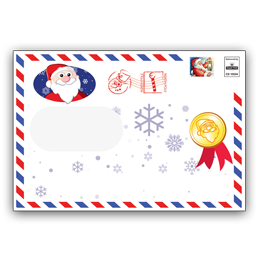 With our personalised letter to Santa pack they can write their letter to the North Pole and pop it in the post with our North Pole addressed envelope. 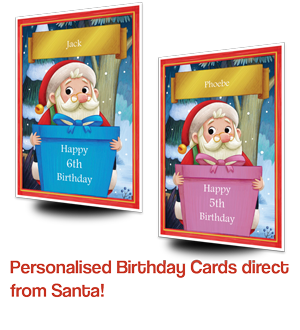 Imagine your little ones face when they receive a personalised Birthday Card from Santa delivered in a envelope from the North Pole, plus they will also receive a text message on their birthday. Imagine your little ones faces when they receive a personalised text message from Santa that you have written giving them praise or a hint to be better so they can stay on the nice list. Are you ready for this? You can now print your own magical Personalised letters rather than waiting for them to arrive in the post, yeah that's right, once you place your order we simply email you a link to download your letter. 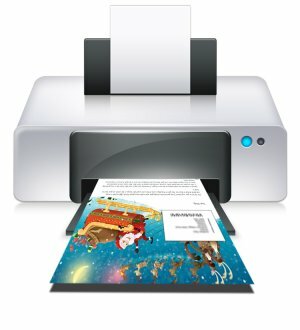 Then all you need to do is send it to your printer and hey presto you have your magical letter in front of you. 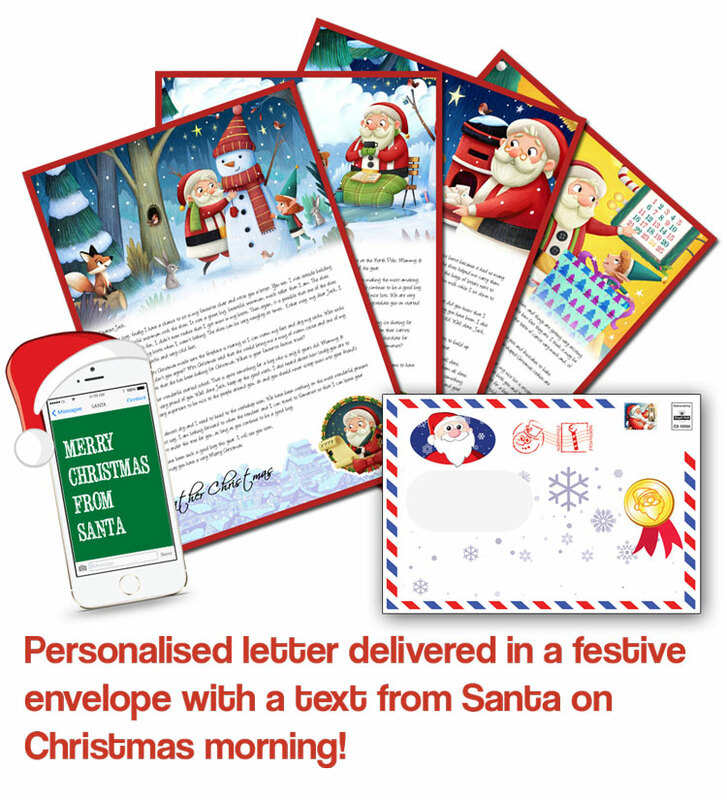 Your letter is fully personalised just like our posted version and your little one will also receive their personalised text message on Christmas Day morning direct from Santa Claus. 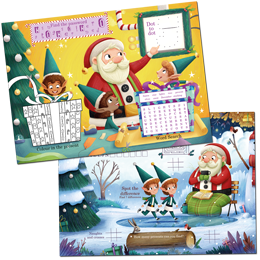 Have your little ones started off the school year really well? Santa would like to send them a well done message from the North Pole. 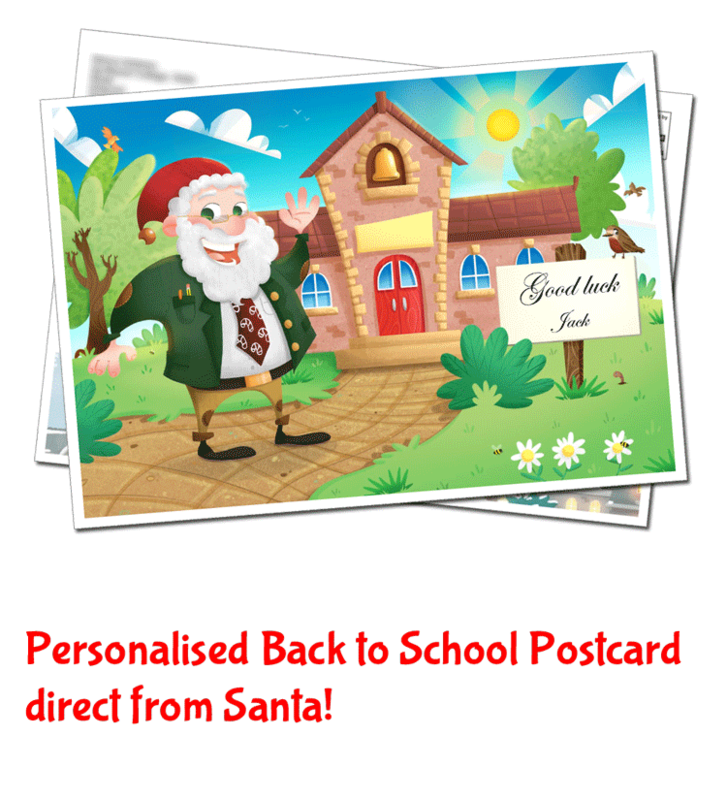 With your little one heading back to school soon, Santa would like to send them a good luck message from the North Pole. 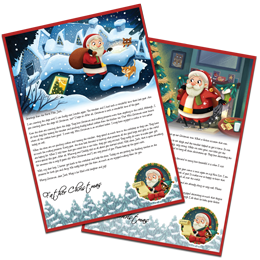 Santa is enjoying some well earned rest during the Summer months and he would love to send your little one a postcard letting them know that he is thinking about them. 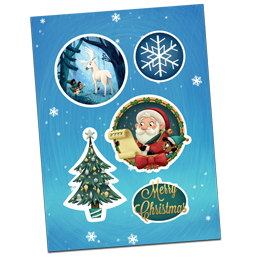 Each and every letter will be delivered in a festive envelope with a North Pole Postmark. Each and every letter is personalised for you and your child giving them that special experience. 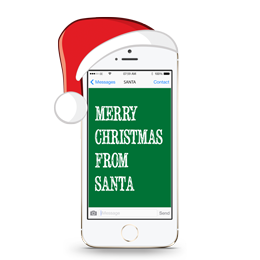 We will send a text message from Santa to your little one on any chosen mobile phone which is sent on Christmas morning. 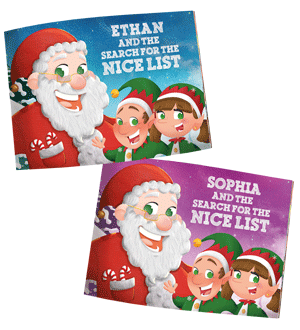 Every child wants to be on Santa's Nice List, well now they know they are with our personalised nice list certificate. Our A3 activity pack is a great addition to any personalised letter, it comes with colouring, dot-to-dot, word scramble, spot the difference and a maze. 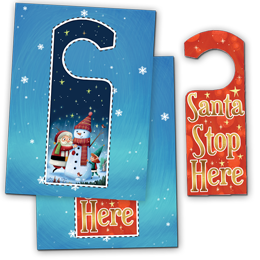 Make sure Santa knows which room to put all the presents in with this door hanger which is ready to cut out which is printed on card. 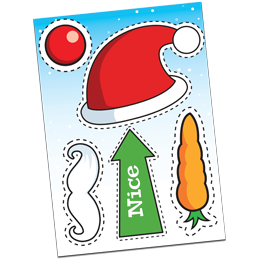 Simply cut out the festive selfie images and you could hold in place by sticking a straw to the back. 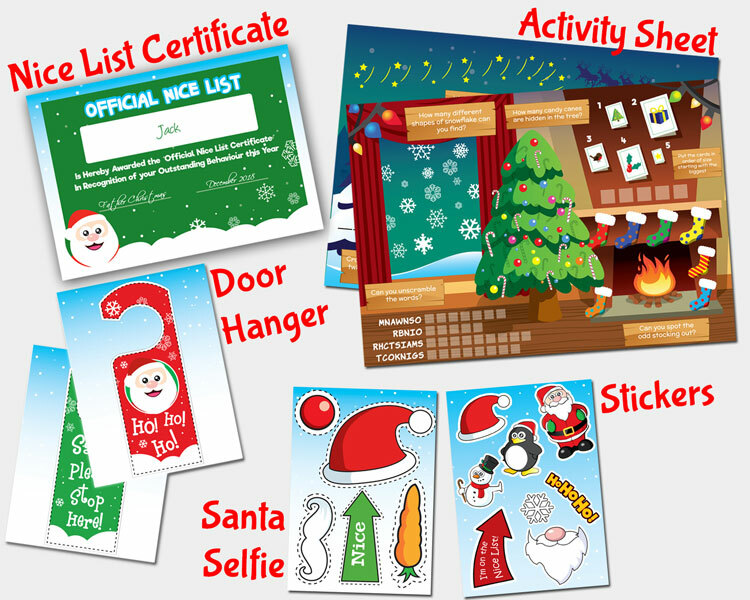 Enjoy Santa, Snowman, Christmas tree plus many more stickers that are included as part of your optional activity pack.